The British Gazette » UKIP: Heading for a pyrrhic defeat? 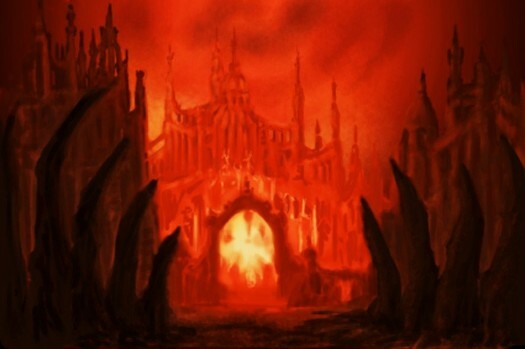 Above, an artist’s impression of Hell. In his blog-post today (http://eureferendum.com/blogview.aspx?blogno=87178), Dr. North speculates upon the possibility of Madame exercising the Royal Prerogative and revoking Article 50 literally at the 11th hour which for the UK given that we are an hour behind Europe would mean 10PM. IF – and it is a very big “if – Madame were to do this the event would likely be stage-managed to perfection. You see, if we reach a situation where we arrive at Friday 29th March 2019 (or a shortish time later) and a “No Deal Brexit” seemingly awaits us one can imagine the news-hounds will be outside the Palace of Westminster. Now IF Madame was to do this the British diplomatic mission in Brussels would of course be advised beforehand. This would be highly classified. The EU would be tipped off in the form of a diplomatic conversation at ambassadorial level. The news organisations would be advised that the OM would be making a statement outside 10 Downing Street at just after 10PM. Clearly the BBC and ITN news anchors would be there filming it live. Madame – looking suitably sombre – would come out into Downing Street where a lectern with microphones would have been set up. And then the lady would make her announcement! Oh! Le théâtre de tout ça! HOWEVER: À propos the use of the Royal Prerogative vis-à-vis Article 50 revocation, we would have the most delightful constitutional crisis to behold. If you were a QC and you dealt with constitutional law and that happened, your wife would likely have a huge smile on her face and be off to Harvey Nicks with your credit card! It will certainly be a feast for lawyers! For a legal challenge would be inevitable. An 11th hour revocation of A50 would of course mean that the associated Brexit legislation would still be on the statute book sans amendment. Quite possibly, A61 of the Vienna Convention would be argued to apply. NB: The Attorney General would likely suggest that the Vienna Convention on the law of treaties, in particular Article 61 apply: “Supervening impossibility of performance”. This states that a party may invoke the impossibility of performing a treaty as a ground for terminating or withdrawing from it, if the impossibility results from the permanent disappearance or destruction of an object indispensable for the execution of the treaty. However there is an aspect closer to home in the sense of the 1688/1689 Declaration/Bill of Rights which of course requires any amendment, creation, suspension or repeal of law to have Parliament’s consent. Since revoking A50 has de-facto legislative effect it could be argued that primary legislation would be required. What of course we would have here is a veritable “dog’s breakfast” comprised entirely of “pig’s ears”! The ECJ which I like to refer to as the European Committee of Juggling – I do not recognise it as a court and it does not dispense justice – would of course rule that the UK’s revocation is valid and since EU law takes precedence over the laws of the member states then it would mean that the Brexit legislation would be held to be NULL & VOID! Were this to happen I would not be one bit surprised were the jugglers to hold a special sitting – in response to a EU Commission request and quickly rule along these lines. The political consequences of such an action would of course be to remove permanently the chaos of a hard Brexit thus saving UKIP and the ERG from the consequences of their own advocacy. It would pump huge quantities of oxygen into those areas of political activism adopted by those maintaining that UK membership of the EU is, was and always will be unlawful. Although a political and democratic disaster, such a scenario would be the best thing since GM free, farm friendly, organically produced, vegan approved sliced bread for UKIP. Well of course, we all know the term and the meaning of, “pyrrhic victory” – for UKIP however it would be a pyrrhic defeat. For the Tories however it would be like finding themselves in Hell!